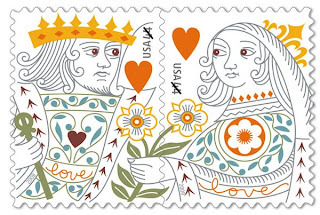 I ran to the Post Office earlier this week, and much to my glee, found this lovely pair of stamps: the King and Queen of Hearts. Interestingly, the Queen of Hearts in a deck of cards is sometimes rumored to be none other than Elizabeth of York, Queen Consort to Henry VII and mother to Henry VIII. She is even said to be Anne Boleyn at times, but I think that's stretching it. The flowers, however, do remind me of the Tudor rose. Could the U.S. Postal Service be riding the waves of Tudor-mania? We may never know, but it is surely more fun to pay bills now.